A team of Northwestern University undergraduates has developed a culturally sensitive way to fight iron deficiency in developing nations. Their project was awarded a gold medal at the regional level of iGEM, a synthetic biology competition, and the students will go on to compete in iGEM’s international competition in November. iGEM (the International Genetically Engineered Machine competition) is a competition in which students are given a kit of biological parts early in the summer from the Registry of Standard Biological Parts, a collection of “mix-and-match” genetic parts. Students work at their schools over the next several months, using the kits — and new parts they design themselves — to build synthetic biology devices and systems and operate them in living cells. This year Northwestern’s iGEM team focused on iron deficiency, a health problem affecting more than 30 percent of the world’s population. The condition — which can lead to fatigue, developmental problems, and even death — is most acute in resource-poor areas where iron-rich foods are scarce. While some may see iron supplements or red meat as the solution, the iGEM team instead focused on getting the most nutrition out of the foods anemic people are already consuming. In the typical grain- and legume-heavy diets of some of these regions, iron is actually quite plentiful in a substance known as phytic acid. The human body just isn’t able to digest it. The students developed a solution: a system that breaks down phytic acid in the digestive system, releasing iron and other valuable nutrients for the body to absorb. The system is unique because it can be grown in yogurt, which fits easily into the dietary routine of people in developing countries. “Our yogurt-based solution fits perfectly into the diets of the people who need it most,” Tang added. 2012 World Championship Jamboree November 2-5 in Cambridge, Mass. 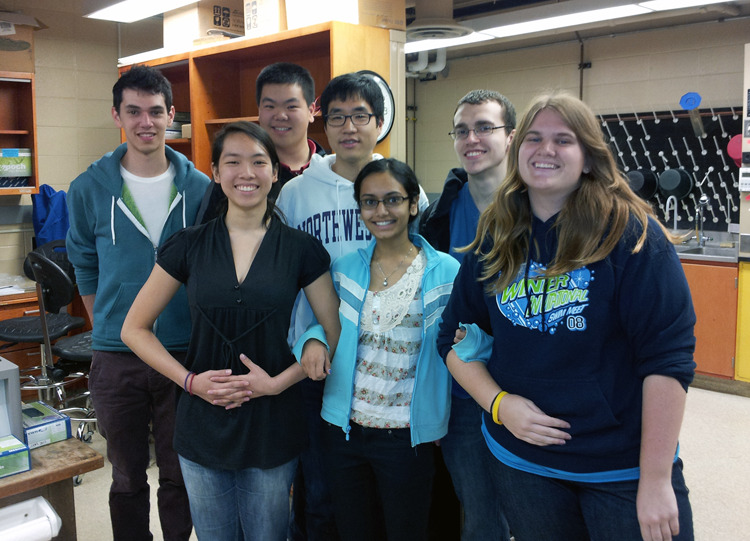 In addition to Tang, Northwestern’s team consists of Sarah Hartman (biology, ’15), Michael Kenton (biomedical engineering, ’14), Grant Nicholas (integrated sciences and biomedical engineering, ’15), Lajja Patel (psychology, ’15), Tae Seong (biology and psychology, ’12), and Yuan Tao (chemistry, ’14). The iGEM project is advised by Michael Jewett, assistant professor of chemical and biological engineering; Joshua Leonard, assistant professor of chemical and biological engineering; John Mordacq, distinguished senior lecturer in the biological sciences department; Keith Tyo, assistant professor of chemical and biological engineering; and Jennifer Schoberg, a graduate student in the department of chemical and biological engineering.